Whimsy and romance permeate through this beautiful video. serpentwithfeet is making complex music. His classically trained voice, Baltimore upbringing, and the hideaways he's found in New York have all influenced his work. His debut EP blisters was released in 2016, blending gospel, R&B, and modern electronic sounds to create mesmerizing songs. Now he's back with the upcoming soil, and he debuted the track “bless ur heart” with an accompanying video. 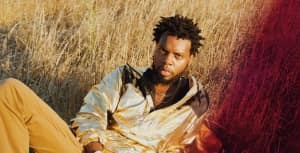 The video features deep lush colors, ornate set design, delicate details, and serpentwithfeet himself, who is captivating in a blood red ensemble. The video was directed by Andrew Thomas Huang, and is premiering exclusively on The FADER. Watch the full video above. Read serpentwithfeet's The FADER cover story here.